There are many special customs and prayers to make this a special time. See My Parent/Teacher Resource page for more information on this special Jewish holiday and the very special event where I taught these crafts. Genwax.com for information on where to buy the wax and lots of lessons on candlemaking. See my Candle Page for general candle information. They can be any color. Use thin wicks, not wire wicks, as it will cause the wax to burn too hot. 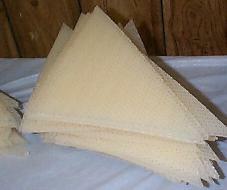 Style #1 Chanukah Candles Tapers 8"
1 right triangle sheet of wax made from 1/8th of a sheets. Sheet of Wax paper or parchment paper to work on. Cut into two 8" squares. Cut each triangle in half = 8 candles from one sheet. 1 Write child's name on label and place on finished candle. Repeat for other colors or candles. 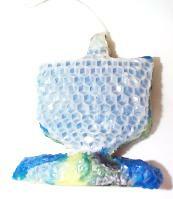 Style #2 Small Candles 4"
1/16 size rectangle of wax. 4" by 2"
The rest of materials are the same as above. Lay each sheet down lengthwise. Cut half in half again. See directions above from step 5 on. Thanks to Jill W. for her help designing these candles. These are rolled like the beeswax sheets. But at the end you take your finger and gently roll the edges over to give them a ruffeled look. Also pictured is a round large taper candle that is cut from a rectangular sheet and rolled smooth. See Eileen's Chanukah Table Candles- Layered Beeswax Candles Using a Cookie Cutter I made the craft for Shalom Boston's Chanukah pages. Check out my Candle Page for more information on making candles. 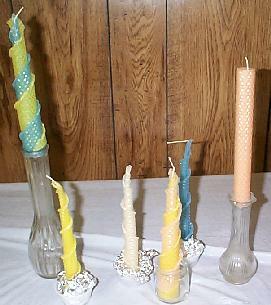 For more Rolling and braiding of candles see see my Havdallah Braided and rolled candles. Also check genwax.com. for information on where to buy sheets large and small quantities and great candle making lessons. Prayers and candle lighting times. Jewish Nature Center.org's Shabbat candles 2 for Shabbat candles made in sand.